It sounds far and exotic, but exactly where is Sumatra? The very name of the sixth largest island in the world conjures images of jungle expeditions, volcanoes, orangutans, and indigenous tribesmen covered in tattoos. But for once, that isn't just a Hollywood exaggeration! Sumatra boasts all of those things — and more — once you escape the busy cities. Located at the far, western edge of the archipelago, Sumatra is the largest island that is entirely in Indonesia. Borneo is actually bigger, but it's split between Indonesia, Malaysia, and Brunei. Sumatra pretty well forms the western edge of Southeast Asia, one last piece of land before the endless Indian Ocean begins. Sumatra is oblong shaped, angled from northwest to southeast. The eastern edge comes surprisingly close to Peninsular Malaysia and Singapore. The relatively narrow Strait of Malacca separates the two landmasses. The southern tip of Sumatra bumps up against Java, with the capital of Jakarta not far away. Perhaps that's the beautiful irony of Sumatra — and an indication of its diversity. Despite being geographically very close to highly developed places such as Kuala Lumpur, Singapore, and Jakarta, you can still easily find deep jungle and indigenous people who follow old traditions. The equator divides Sumatra neatly between the Northern Hemisphere and the Southern Hemisphere. Sumatra is located south of Thailand and Myanmar (Burma); west of Malaysia and Singapore. Jakarta, the capital of Indonesia, is in Java not far from the southeast tip of Sumatra. India and Sri Lanka are located across the Indian Ocean, northwest of Sumatra. Sumatra could be unofficially carved into three regions: North Sumatra, West Sumatra, and South Sumatra. North Sumatra gets the most attention from travelers. Most arrive in Medan and head to Lake Toba (the largest volcanic lake in the world), the interesting island in the middle, and Bukit Lawang — the base town for treks to observe orangutans in the Gunung Leuser National Park. West Sumatra comes in second for tourism, however, it mostly caters to skilled surfers and serious travelers looking for outdoor adventures a little off the beaten path. Both regions could easily wind up on the well-trodden backpacker Banana Pancake Trail one day but so far have seen stunted growth for tourism. Outside of holiday periods, there are too many empty guesthouses with views ringing Lake Toba. Don't think that just because Sumatra harbors orangutans and potentially uncontacted tribes that it's nothing but thatched huts and dirt roads. At least six of the busy cities on the island have populations of over a million people! Traffic can be horrific; driving there requires tenacity. Medan, the capital of North Sumatra, is home to over 2 million people and boasts the third largest airport in Indonesia. Over 50 million people call Sumatra home (per 2014 census) making it the fifth most populous island in the world. Indonesia as a whole ranks fourth in world population, just behind the United States. Sumatra is oriented from northwest to southeast; it is approximately 1,110 miles from tip to tip. 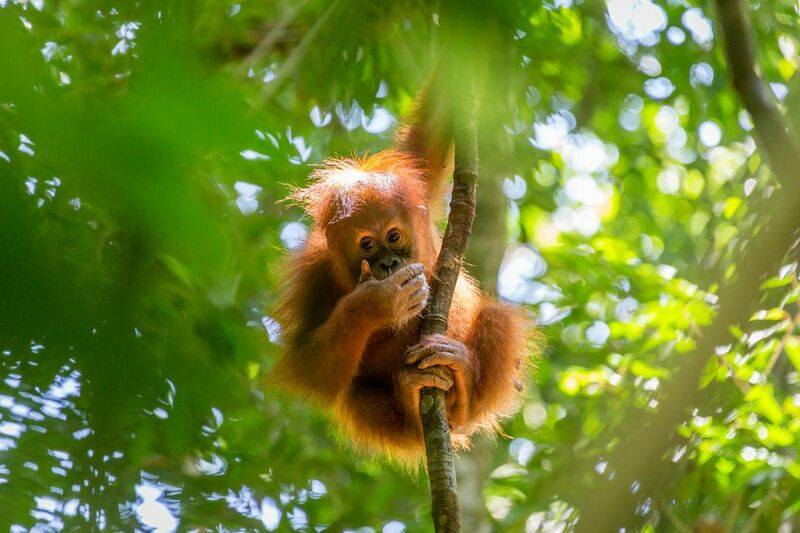 Sumatra is one of only two places in the world to see wild orangutans (Borneo is the other). The fertile volcanic soil in Sumatra grows some of the best coffee in the world. One of the most expensive varieties, kopi luwak, is "processed'" by feeding coffee cherries to civets — weasel-like animals — in Sumatra. Today, there are a lot of knockoffs meant to relieve tourists of money, but the original kopi luwak came from Sumatra. The Batak, a term applied collectively to the Karo and other indigenous tribes in Sumatra, once practiced headhunting and ritual cannibalism. Marco Polo passed on second-hand accounts of cannibalism in 1292 despite not witnessing it himself. The practice was rare after the 19th century, however, human sacrifice altars made of stone can be found in Pulau Samosir. Lake Toba, the largest volcanic lake in the world, was formed during a cataclysmic explosion. The event actually altered temperatures across the planet and is thought to have killed much of the existing global population. The resulting crater is 62 miles long, 18 miles wide, and 1,600 feet deep in some places! The water stays a comfortable temperature thanks to geothermal activity. Fire literally meets water in the extreme depths! Volcanic pressure has forced a new island, Pulau Samosir, to form inside of the lake. Lake Toba is a favorite of budget travelers. The most popular entry point for travelers visiting Sumatra is Medan. Sumatra is connected via Kualanamu International Airport (airport code: KNO). The new international airport replaced the old Polonia International Airport in July 2013. There are no direct flights between North America and Sumatra. Most flights connect to Kuala Lumpur, Singapore, or other points in Indonesia. Travelers from the United States should book a flight to a major hub such as Bangkok or Singapore then grab a cheap budget hop to Medan. Flights to and from Bali are also easy to find. For travelers wanting to explore West Sumatra, the city of Padang (airport code: PDG) is the best entry point. From there, many people head a few hours north and use the smaller town of Bukittinggi as a base for exploring the region. Experienced surfers often head west to the Mentawai Islands just off the coast. Sumatra is big — sprawling, even. The rough roads and wild driving can be very trying for travelers who prefer to go overland. Only the most road-hardened travelers should consider opting for the 20-hour bus between North Sumatra and West Sumatra. Flights are quick, inexpensive, and don't require you to find a chiropractor shortly after arriving. Plan plenty of extra time — both for rest and buffer days when things go wrong — if you intend to explore more than one region of Sumatra on a trip. Lake Toba: The lake is great for relaxing, adventure activities, and for learning about the Batak culture found there. Tuk-tuk is the name of the tourist town on Pulau Samosir, the island in the lake. Bukit Lawang: The small, riverside village is the usual base for exploring Gunung Leuser National Park, a popular choice for short or long jungle treks to see wild and semi-wild orangutans. Spending a night in the jungle increases your chances of seeing more wild orangutans, but semi-wild ones linger near the national park entrance. Gunung Sibayak: Using the town of Berastagi as a base, adventurers can climb inside the crater of Gunung Sibayak, Sumatra's easiest volcano to tackle. But don't be fooled: Gunung Sibayak is still tough. The high-pressure gases being vented and boiling streams along the way are a constant reminder that the volcano is still active! Gunung Sinabung: Sibayak's neighbor, Gunung Sinabung, once took around 12 hours to climb, but it's been in a constant state of eruption since 2013! The volcano was dormant for nearly 400 years before unexpectedly exploding and forcing evacuations. Today, the volcano is generally considered too active to be open for tourism. Gunung Marapi: West Sumatra's big active volcano can be climbed in about 10 hours, but it's hard work! Dangerous scree near the top needs to be scrambled before reaching the mud-plugged caldera. Gunung Kerinci: Located between West Sumatra and South Sumatra, Mount Kerinci is the highest volcano in Indonesia. You'll need lots of stamina and a guide to tackle this one; an overnight is required, and the trail is difficult to follow. Lake Maninjau: If climbing volcanoes is too much, or you just need a break, the massive Lake Maninjau in West Sumatra is a quiet place to relax and fish. Before setting off into Sumatra's wilds, you should know some hiking safety for the region and how to stay safe around monkeys — you'll encounter lots of cheeky macaques who may take an interest. Look out the window during your approach to land in Sumatra. You'll see manicured palm plantations that reach like a green sea for miles in every direction. They may look nicer than urban sprawl, but they do pose a serious ecological problem. Sumatra and Borneo account for more than half of all palm oil produced in the world. The two islands also suffer from the worst deforestation on earth — even worse than the often-publicized plight of the Amazon. In addition, slash-and-burn agricultural fires are so large scale in Sumatra, they make a sizable addition to the annual greenhouse gas released for the planet. The seasonal smoke then drifts over to choke up Kuala Lumpur and Singapore, causing health and economical strains. Sometimes the airports even have to be shut down for low visibility! Although sustainable palm oil is a good thing, most is produced in the easiest way unless it can be certified otherwise. Avoiding products that use unsustainable palm oil may be the only hope for Sumatra. Palm oil isn't just for cooking; it's used to make SLS (sodium laureth sulfate) and derivatives that help soaps, shampoos, toothpastes, and a variety of products to lather. It's often the primary ingredient for cooking oils that simply label themselves as "vegetable oil." Palm oil is also used as a biofuel to supplement petrol, despite high inefficiency. The uncontrolled deforestation in Sumatra has pushed many endangered species such as tigers, orangutans, rhinos, and elephants nearer to extinction. The Sumatran tiger is listed as "Critically Endangered" on the IUCN Red List, and populations are in decline.